Innovation, price point, usability and environmental impact. We love products and companies that strive to meet these credentials. When a product meets three of these four criteria, we consider it to be particularly noteworthy and deserving of your attention. When the company concerned is a small startup trying to do the right thing, we will do everything in our power to offer exposure and a leg up. One such company is Cab9 eyewear. Earlier this year I had the pleasure of reviewing a pair of their C9X sunglasses (see the review). Needless to say, I was suitably impressed. This is a well designed, functional product at a more than fair price point. It recently came to our attention that the gents at Cab9 are trying to take their product line up a notch. By the way, folks, don’t just watch the video, read everything that comes with it, these guys have come up with a real innovation, that will be great news for all of us who spend prolonged periods in the sun. Some Cab 9 models doing modely stuff. Great, functional shades at a reasonable price. I had a chat with Paul at cab9 with a question or two, just to expand on a point or two. SB: What is the innovation as regards the lenses? Is it mainly the Infrared aspect? Yes, that’s right. We were looking for a way to reduce eye fatigue when exposed to bright sunlight for long periods. When we’re working on the slopes we can be in the sun for 8 hours straight and even with good quality lenses your eyes can get tired. With the combination of near-infrared protection and the other lens features, it’s noticeable how your eyes are more relaxed even in intense sunlight. SB: Has the lenses manufacturer had to change their process etc, as regards what they normally put out. This is the first time they will be producing this lens so in regards to the production process, yes there will be some new aspects. The Cab 9 Edge, in testing this winter in harsh sun environment. Technical, functional and at a sensible price. SB: Is this new lens unique, or equivalent to something you would expect to find in a high priced product. As far as we’re aware it’s unique and is currently patent pending. SB: Good luck by the way, I hope you guys smash it outta the park. As you can see folks, these guys are well on the way to bringing to market a great product, that will benefit all of us in the long run. All they need is a little push over the finish line...Let's hope they do it! 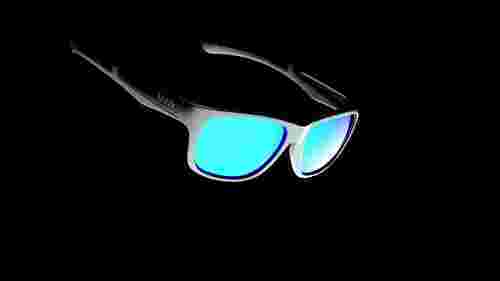 Cab 9 Eyewear are going for funding for thier new Edge model. Here is what they look like. The guys at Cab 9 have produced something that is superior in design and functionality. They don't look to bad either. We give you the Edge.